I'm going to bring up kind of a weird subject for this blog. and I don't want to step on any toes. it's related to how I do my job. and body perception and all that fun stuff. sometimes does weird things when it comes to this topic. And I do legitimately like the story and the counting aspect and the ultimate progression for the little caterpillar. That is, I enjoy it all the way up until I get to the part after the caterpillar EATS THE WHOLE WORLD. You know the part. "Now he wasn't hungry any more - and he wasn't a little caterpillar any more. He was a big, fat caterpillar." This is my problem, and it's only just dawned on me this happens: I don;t say the word "fat" when I get to this part. I just...can't. Like, my mouth will literally not form the word. I invariably skip it and say "he was a biiiiiig caterpillar" or something like that. I'm sure I'm not fooling anyone. But there it is. Because for me, "big" is the logical opposite of "little." And "fat" carries with it a negative connotation. Have you ever heard the words big and fat used together in a positive way? Probably. But that's not where my brain goes. This is what I think when I get to that part of the story: what if one of these sweet kids here in this room has been teased and called "fat" by his classmates? What if he or she has a parent who might be compulsive about healthy eating? What if he or she is one of the growing number of kids who has poor body image? Yes, I have these thoughts AS I am reading the book. I told you, my brain does weird things. using the term "fat" for the caterpillar. It's a descriptive word. It's realistic. The book was written in a different time, before the childhood obesity epidemic and large soda bans and all that. Besides, caterpillars don't typically have body shame issues, do they? been used that way since what seems like the dawn of time). Besides, we can't view the language of a classic picture book through a lens of societal context, can we? Or maybe this is stupid. Maybe I am just thinking too much. I do that a lot. Maybe I am just projecting my own self-esteem issues onto that poor hungry insect. Maybe I've called myself "fat" too many times in my own life to hear something that's not negative. So, lay it on me. Is my reaction hyper-sensitive? Is it overly-PC? Is it censorship? Would the word even register with kids in the way that I'm thinking? Am I doing any harm by NOT saying it? Is "big, fat caterpillar" just a silly phrase? I don't know. Maybe I need body image therapy. Or maybe I just need to switch to a different book for class visits. I do love that little caterpillar, though. I don't know if it's something you'd want to do, but you could recite the sentence as it was written and then ask kids what they thought of the big, fat caterpillar. It could be used as a teaching moment to address that it's okay that the caterpillar was fat after eating so much, since that's the logical conclusion. And that the caterpillar had no body-shame issues, and so on. But if that's just a thought. That's an interesting suggestion. I think my fear would be that since I'm not a child psychologist or anything, I wouldn't know the best way to respond to any issues that might arise. I don't want to scar anyone for life, even with good intentions! It probably is censorship in a way, but I do the same thing. I also find myself replacing the word 'stupid' with 'silly' in a lot of children's books. Is that wrong? You should do whatever makes you comfortable! Hmm, I would probably do the same with "stupid." It's a tough call and depends on the situation. If it doesn't take away from the story to leave it out, then I don't have THAT much of a problem with the censorship aspect. Personally I'm a big (in both senses) fan of reclaiming the word fat. I am fat, and I have been all my life. I can't speak for anyone else, but for me, not saying the word never made me feel that I was NOT fat -- it just made me feel that the person talking views what I am as an unspeakable thing. The key, to me, is to do exactly what the book does -- to use it as a neutral, or even positive, descriptive adjective, to give little fat kids everywhere examples to identify with in which they are not perceived either as problems to fix or as things which polite people pretend aren't there. But then I didn't grow up in the era of medicalized childhood obesity either -- I certainly took plenty of crap for it, but it wasn't coming from the First Lady or my parent's insurance company. So for today's kids, who knows? That's an interesting perspective and I thank you for sharing it. I think the thing is that I have never seen it in this context as being used in a positive way. I see it as "he eats a lot and then gets fat and that's not good so he better turn into a butterfly now." (And that just might be my warped brain talking, if brains can talk.) You've given me things to think about! I always read it as written, but I do feel a twinge of discomfort every time. It makes me feel better that other people feel weird about it and edit as they read. While I think that if you have a problem saying the word and shouldn't force yourself to say it if you don't want to - I also think it might be worth thinking about from another angle. What if there is a kid listening who does have body issues and has had the "F" word applied to them (either by others or themselves), and then through this book finds that the word doesn't have to have a negative connotation? Maybe that's hogwash. But I think it's nice to know, especially as a child, that words don't have to mean just one thing . . . These are valids points that I hadn't considered (mostly because, as I stated in another comment, I had never seen it as positive). Words definitely don't always mean one thing, and that's a good lesson! I haven't considered the word "fat" to be a particular problem, though I understand where you're coming from. I feel that in this case the word is presented as a simple descriptor, no judgment implied. And unlike in some books -- e.g., What Will Fat Cat Sit On?, by Jan Thomas -- "fat" does not equal "hilarious joke." Plus, I guess my personal interpretation has been that the caterpillar has to eat a lot in order to turn into a butterfly -- a getting-big-and-strong kind of thing. But then, chrysalises aside, I know pretty much jack about butterfly biology. Ha, yeah, I love it when a kid pipes up and says "IT'S A CHRYSALIS." Maybe something similar would be bears who eat and eat and get "big and fat" before they hibernate for the winter. It's not a judgment on the animal - they're just doing what they do. No judgment from me, though, whether you want to use the word "fat" or not. You should do what you're comfortable doing. I can relate to your sensitivity - I've always had a kind of gut-clenching reaction to the word "short" for the same reasons. But by the same token, it really only bothers me if its directed at me personally. I think the power of third-person stories is that we can hear a character described as "fat" and, if we like that character, relate to and empathize with that character as an extension of ourselves. If there's one thing worse than thinking of yourself as fat, it would be thinking that you're the only fat person in the whole world. For that reason one of my personal heroes has always been Charles Schulz. I found in Charlie Brown a friend who also understood what it was like to be short, round and forever frustrated in his attempts to win in life. But I learned to laugh at my own insecurities even as I laughed along with the Peanuts gang. Who knows what a kid hears in the word "fat"? But if you say it with warmth in your voice maybe she carries away the notion that even a really fat caterpillar (or person) can be loved. The kids in the audience might have fat issues, but censoring the word fat doesn't really help. Fat issues and bullying aren't dealt with by blocking a word or denying reality of people being overweight. Fat issues are dealt with by stigmatizing bullies, encouraging a healthy lifestyle, and acceptance of people of different shapes and sizes. I think it would be good to say it. I think further stigmatization by not saying it complicates matters. The thing is - the only way it's going to get easier for any of us, regardless of age or shape, to say FAT as a word that is descriptive and not insulting is to ... SAY IT. I am fat. I am a big, fat girl. That's no different than saying I have brown hair or that I wear glasses. As I say on my blog's "about me" page: Fat is just a descriptor for how I look, I reject it as a value judgment/moral statement about who I am. And the only way we're ever going to start helping children and teens get to this point - where they too realize that's all fat is, a single descriptor about a person or a caterpillar, is by saying it. When we dance around it, when we say "pleasantly plump" or "you're not THAT fat!" we continue to stigmatize the word. This is a word I CAN take back. And I will. I'm a big fat girl. And the caterpillar? He WAS a big fat caterpillar! That's right! And he still had this interesting adventure happen to him as he changed and learned. FAT was only part of his story. And it's only part of mine. Thank you so much for sharing these posts, Angie. It's an important topic and you write so eloquently and bravely about it. And I think you're right. It's hard for me to fight against what I've been hearing, thinking, and feeling my WHOLE LIFE. But I want to do better for the kids who I might affect, in whatever way. So maybe I just have to change my outlook and not the vocabulary of the story. Big and fat are positive together in discussion of paycheck and wallet. I don't think a caterpillar matters too much either way though. Doesn't hurt to skip it, but as long as it's not overly emphasized I don't think it would hurt much to include it either. 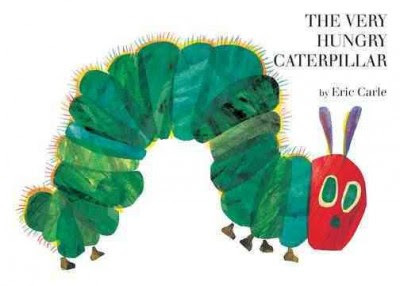 I have read this for my two-year-old storytime many times, and I must admit that it never crossed my mind to consider that "fat" was a negative descriptor of the caterpillar. But like you, that might be just me and where I'm coming from. It might also be that I'm reading it to two-year-olds, who generally aren't thinking about bullying (unless another kid tries to take their toy away) and body-image issues. I read an article one time that mentioned that Eric Carle grew up in Germany during WWII, and was very very hungry by the end of the war. When the Americans came in he worked as a translator, and ate tremendous amounts at the base camp because he wasn't used to having such an abundance of food available. So for your class tours, maybe you can throw in some of this history about how good it felt to him to be able to eat so much after being hungry for so long. He's not fat, he's fluffy. Caterpillars can be fluffy. I can completely relate to your sensitivity to the word 'fat' - but consider this: By using it in the context of the big, fat caterpillar, doesn't that help dispell the negative connotations of the word? 'Fat' is only a bad word if we define it as such. I do the same thing. I substitute big for fat. I've had the same problem with reading that part of the story as you for ALL the reasons you've mentioned. Great post and great reminder of the changing dynamics of words from the time the book was published to today. On an unrelated note, I once made a rule for myself that anytime I called myself the f-word, I had to stop, touch my stomach with both hands and say, "I'm sorry. I love you." And it did wonders for my self-esteem. I support giving love to the caterpillar in the same fashion.